This CT scan shows a single lesion (pulmonary nodule) in the right lung. This nodule is seen as the light circle in the upper portion of the dark area on the left side of the picture. 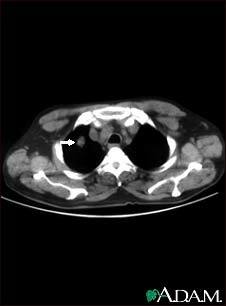 A normal lung would look completely black in a CT scan.